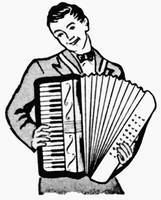 Accordian players are the brunt of a lot of jokes by musicians and others. One quick one: What’s the epitome of optimism? An accordionist with a beeper. (Ba-da-boom!) Here’s another. An accordionist parks his car on a city street, gets out and walks away. A block and a half later, though, he suddenly realizes he forgot to lock the car doors. And his accordion is in the back seat! Oh, no! Well, he runs back to the car fast as he can, opens the back door, and what does he see? Now there are two accordions in the back seat!